Alternates let you define multiple glyphs for a letter, a digit, a symbol or any other character of your alphabet, so your font ends up with a main glyphs, and secondary, alternate glyphs. Alternate glyphs can vary in form, spacing or even color (mind that while color fonts are only supported in InDesign CC 2019+, Illustrator CC 2018+ and Photoshop CC2017+, alternate glyphs can be use in older versions of Adobe apps, Apple Pages, Keynote or MS Word). The OpenType format defines an alternate as a substitution of a glyph by another one, picked from a defined set of possible glyphs. Many types of substitution are defined to cover all languages needs (contextual, stylistic, access all, etc.). 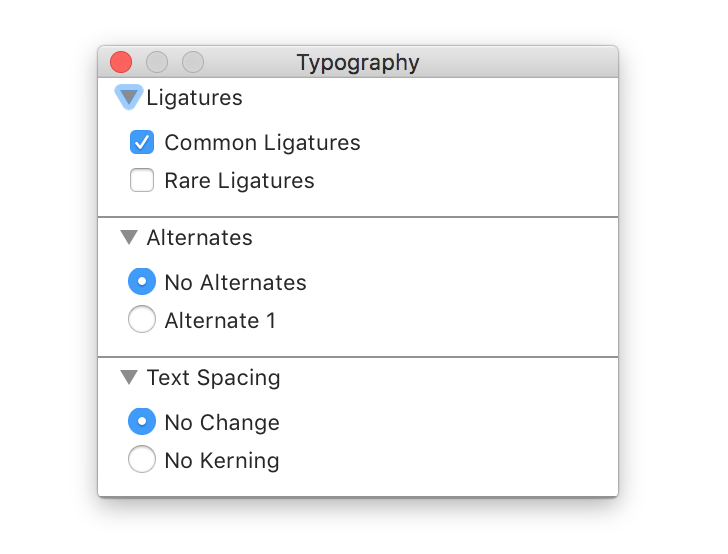 To keep things simple, Fontself Maker currently defines only one type of alternates, called aalt for access all alternates. This type makes all alternates of a selected character always accessible. Individually, by pressing the Create Glyph button (first select your alternate shape, then type it's corresponding character in the text field Type any character). Fontself Maker proposes to create an alternate for this glyph. Or you can simply rename an existing glyph into another character. You can create as many alternates as you wanted for any glyph, except for ligatures. Alternates are always sorted and named on basis of their creation order. For instance here, A has two alternates named alt1 and alt2. If alt1 is removed, alt2 takes its place and becomes the new alt1. 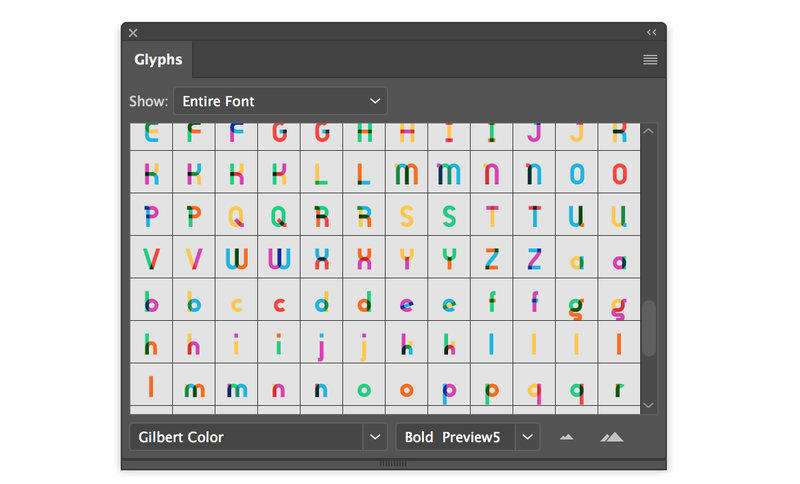 Illustrator, Photoshop and InDesign let you display and pick alternates just by selecting the character like in Fontself Maker. You can also display your entire glyph table with all alternates via Window > Glyphs. 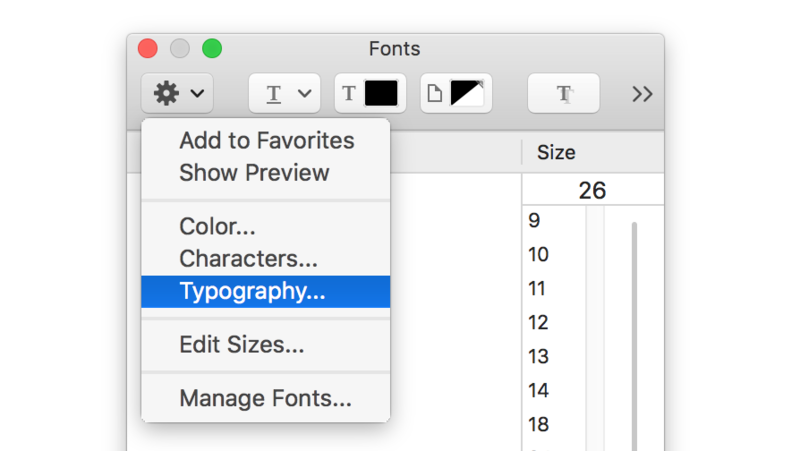 MacOS apps generally propose a font menu accessible via Format > Font > Show Fonts (or just press Command-T). Microsoft Windows apps generally propose a Font menu by right-clicking on a selected text. 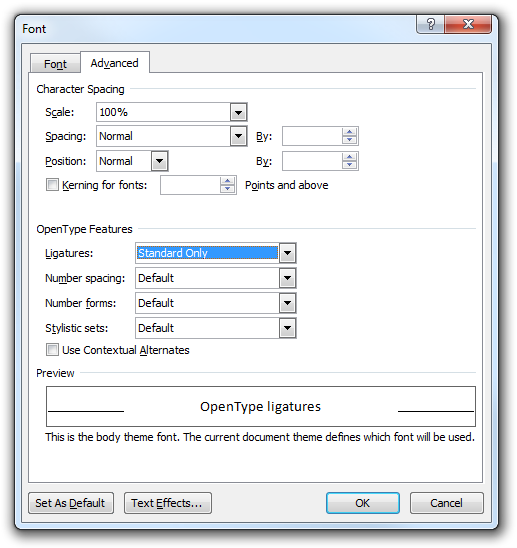 This Font menu allows you to setup several font features, in particular alternates. 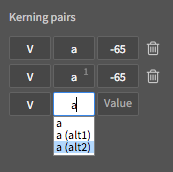 Got any issues when using alternates? Check this article.